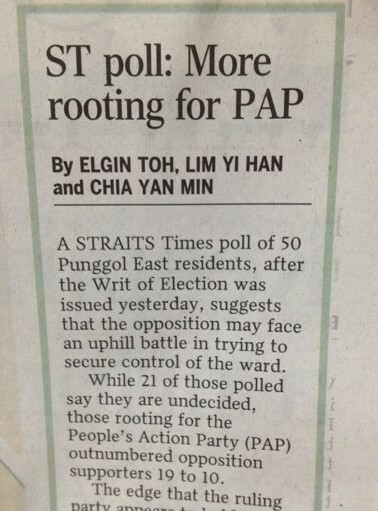 Singapore's mainstream newspaper The Straits Times got into trouble with the law for publishing a poll result on the coming Punggol East by-election. Specifically, Chapter 218 of the PEA reads," No person shall publish or permit or cause to be published the results of any election survey during the period beginning with the day the writ of election is issued for an election and ending with the close of all polling stations on polling day at the election". The Straits Times article was published on Thursday 10th January 2013, a day after President Tony Tan had issued a writ for a by-election to be held on 26th of this month. The Elections Department (ELD) has confirmed an ongoing police investigation into an election poll result published by the mainstream paper. 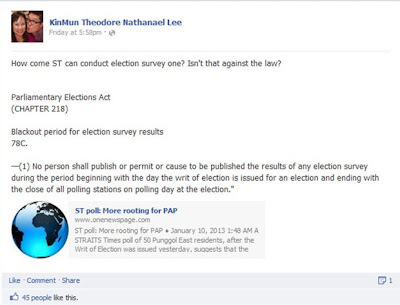 “In response to media queries about the poll on the Punggol East By-Election published in The Straits Times on 10 Jan 2013, the case is currently being looked into by the Police,” said a spokesman for the ELD on Sunday evening. Local blogger Lee Kin Mun, better known as Mr Brown, first questioned the legality of the newspaper's actions on Friday evening, in a public post on Facebook. He accompanied his question with the relevant section of the Act that specifically stated the period restriction under which polls cannot be made. Straits Times editor Warren Fernandez on Sunday apologised for the lapse and said the paper would cooperate fully with the police. "Our reporters spoke with residents in Punggol East to get their comments and a sense of the ground for our election reports. This was not a full-scale survey, or scientific poll, by any means," he reportedly said. 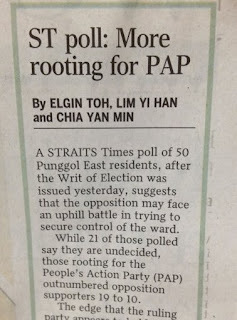 "The headline for our story overstated the significance of the information gathered by calling it a poll. We are sorry for this lapse." In 2011, Joseph Ong Chor Teck was arrested for conducting an exit poll on the then-Temasek Review Facebook page. Anyone who is found guilty of conducting an exit poll within the specified time period in the Parliamentary Elections Act is liable to face fines of up to $1,500 or a jail term of up to a year, or both. Since the above mentioned person had been taken to task, let's see if the Straits Times will simply get away with it or be punished in accordance of the law.